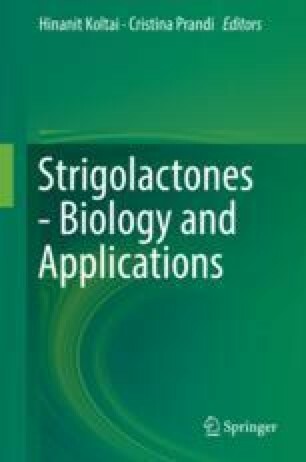 In the last decade strigolactones have been recognized as a novel type of plant hormones. They are involved in the control of key developmental processes such as lateral shoot outgrowth and leaf and root development, among others. In addition, strigolactones modulate plant responses to abiotic stresses like phosphate starvation and drought. Here we summarize the current knowledge of the widely conserved functions of strigolactones in the control of plant development and stress responses as well as some of their reported species-specific roles. In addition, we will review their known genetic and functional interactions with other phytohormones. The newly discovered activities of strigolactones as plant hormones raise the possibility of using these compounds and their signalling pathways as tools to optimise species of agronomical importance. Carotenoid-derived phytohormone that regulates many aspects of plant growth, development and cellular signalling. ABA controls seed dormancy, seed maturation, vegetative growth and responses to various environmental stimuli such as stomatal closure during drought. Relatively fast and reversible changes that individual organisms undergo in response to environmental changes. Evolutionary process that affects species (or groups of individuals) and leads to better fitting to the habitat via genetic, physical and chemical adjustments. Organelles found in some plant cells responsible for the synthesis and storage of starch granules, through the polymerization of glucose. Sedimentation of amyloplasts is associated with gravity perception in specialized gravity-sensing cells. Plant pigments of the flavonoid family synthesized via the phenylpropanoid pathway. They are found in all tissues of higher plants. Depending on cellular pH, anthocyanins may appear red, purple or blue. Phenomenon whereby actively growing ‘dominant’ shoot branches prevent the outgrowth of new branches. Removal of the apices of dominant shoots allows the outgrowth of previously inhibited branches. Type of mycorrhiza in which the symbiotic fungus (AM fungi or AMF) penetrates into plant cells and forms characteristic exchange bodies known as arbuscles. Phytohormone with a huge array of roles in the coordination of plant growth and development. Endogenous auxin is indole-3-acetic acid, but a range of additional auxin-like molecules and synthetic auxin analogues with related structures also exist. Polyhydroxysteroid phytohormones. They promote stem elongation, cell division, root development and stress responses. Brassinolide is the most common brassinosteroid. Vascular-associated tissue layer that can undergo divisions to allow the radial expansion of plant tissues (‘secondary growth’). Interaction of signal transduction pathways. Class of phytohormones with a range of structural forms. Cytokinins act as both root-to-shoot and shoot-to-root signals and are involved in various aspects of development including promoting shoot branching, inhibiting leaf senescence and promoting meristematic activity. Gaseous hydrocarbon with the formula H2C=CH2. It is a natural phytohormone that stimulates fruit ripening, flower opening and abscission (or shedding) of leaves. It is also used in agriculture to promote ripening of certain fruits. The time taken for a flowering plant to pass through the vegetative phase and enter the reproductive phase. Typically measured either in absolute time or as number of nodes a plant produces before formation of the first flower. Phytohormone involved in breaking seed dormancy, promoting seed development, stimulating stem and root growth, inducing mitotic division in the leaves of some plants and promoting vegetative and floral growth. Process of differential growth in response to gravity. It is a general feature of all plants. Roots show positive gravitropism (i.e. they grow in the direction of gravitational vector, i.e. downwards), while stems show negative gravitropism. Butenolide compounds found in the smoke of burnt plant material, which act as plant growth regulators and stimulate the germination of seeds. Karrikins act through the KAI2 receptor but are not an endogenous ligand for KAI2 (KAI2-ligand, KL). Specialized areas of tissue in which the vast majority of cell divisions in plant occur. Meristems generate new cells that allow the growth of the plant in various dimensions. In flowering plants, the embryonic root and shoot apical meristems give rise to the entire root and shoot system, respectively. Axillary meristems are secondary shoot meristems formed in the leaf axils. Cambial meristems are responsible for the radial growth and thickening of the stem. Symbiotic association between a fungus and a plant. Mycorrhizas play important roles in soil biology and soil chemistry. Mycorrhizas may involve colonization of the extracellular space (ectomycorrhizas) or intracellular colonization (arbuscular mycorrhizas). The association is generally mutualistic, but in particular species or in particular circumstances, either partner can parasitize the other. Nitrogen fixation is a process by which atmospheric nitrogen (N2) is converted into ammonia or other organic molecules. Nitrogen fixation is carried out naturally in the soil by nitrogen-fixing bacteria. Certain nitrogen-fixing bacteria have symbiotic relationships with plant groups. Especially notable is the association between legumes (Fabaceae) and Rhizobia spp. In legumes, root nodules are specialized structures that host the symbiotic nitrogen-fixing bacteria. They are typically formed under nitrogen-limited conditions. Minimum pressure required to be applied to a solution to prevent the inward flow of its pure solvent across a semipermeable membrane. It is also defined as the measure of the tendency of a solution to take in pure solvent by osmosis. This process is of vital importance in biology as the cell’s membrane is semipermeable. The ability of a plant genotype to generate different phenotypes in response to varying environmental conditions. Vascular plant tissue that transports the soluble organic compounds made during photosynthesis, photosynthates, in particular sucrose, to parts of the plant where needed. One of the most commonly used synthetic strigolactone analogues. Bacteria that fix nitrogen after becoming established inside root nodules of legumes (Fabaceae). The soil surrounding and directly influenced by plant roots. Biological process in which RNA molecules inhibit gene expression or translation, by neutralizing targeted mRNA molecules. The generation of RNAi transgenic lines is an approach commonly used in plant research to cause precise and efficient gene suppression (knock-down). Chemicals that are exported by the roots into the rhizosphere, which play a variety of roles in communication with microorganisms and manipulation of the physical and chemical properties of the soil. A process of deliberate organ breakdown, allowing recycling of nutrients to growing and storage organs of the plant. Senescence typically occurs in older organs, to fuel the development of new organs. Senescence may be increased under stress conditions. Stems, often called runners, which grow at the soil surface or just below ground that form adventitious roots at the nodes and new plants from the buds. They support vegetative propagation. Pores found in the plant epidermis that facilitate gas exchange. They are bordered by a pair of specialized epidermal cells known as guard cells that are responsible for regulating the size of the stomatal opening. It is the measure of the rate of passage of gases through the stomata of a leaf, mostly carbon dioxide entering, and water vapour exiting through the stomata of a leaf. It is directly related to the absolute concentration gradient of water vapour from the leaf to the atmosphere. The process by which some plant species develop tubers, enlarged modified stems used as underground storage organs for nutrients. Continuous tissue system that allow transport of water and nutrients around the plant body. There are two main types of vascular element, xylem and phloem. Vascular elements typically occur in ‘vascular bundles’, which also include supporting and protective tissues. One of the two types of transport tissue in vascular plants. Its main function is to transport water and mineral nutrients from roots to shoots and leaves. Potential energy of water per unit volume relative to pure water in reference conditions.